The hobby horse for my nephew is essentially done! And by essentially, I mean that I still need to finish stuffing it, weave in two ends, re-sew up the ears, and find a cane/dowel/broom handle to use as the ‘body’ of the horse. But that’s not really so VERY much left, is it? Right. I do not have all that much experience knitting fair isle, so this was a really fun opportunity to experiment with color and tension while carrying yarn around back. My approach was to twist the two colors I was using around each other after every two stitches, to keep things nice and even. This worked out well, and now the ‘horse’ feels very thick because there is a double layer of yarn, so to speak. The pattern called for eyes to be sewn on using duplicate stitch, but I thought that buttons would be more fun and really pop. Brandon thinks I should make the mane a little bit fuller than the pattern called for, as right now it looks a little like the horse is balding, or maybe like he has a mohawk. I’m still debating whether to add more or not, so if you have an opinion on the matter, please leave it in comments! After working on my lace shawl for so long, this project felt like it knitted up in seconds, and my size 10 needles felt ginormous in my hands. I loved everything about this pattern – it was complex enough to be interesting and fun, but simple enough to not be frustrating. It is a very adaptable pattern, with a lot of room for experimentation with color or form. I considered doing something else for the ears besides knitting them on, for instance – maybe a piece of soft leather sewn on? – and there are plenty of other places for extra little touches to be added, such as the button eyes. The sky is the limit with this pattern! I used Lamb’s Pride worsted weight yarn, 85% wool/15%mohair from Brown Sheep Company. One skein of each color was way more than enough, and I am now using the leftovers for a few fun little projects that I will be blogging about at a later time. The one thing about using this yarn that was a little annoying was that it is variable in its thickness, so at some parts of the horse there are little gaps where the yarn is thin. Other than that, I absolutely loved working with it, and I am planning to buy more for other projects in the future. If you are interested in buying some, there is a link to the company’s website here. The pattern I used was in the Fall 2012 issue of Interweave Knits, my favorite knitting magazine, as discussed in a previous post. A link to pictures of all of this issue’s projects – and to subscribe to the magazine if you would like – can be found here. 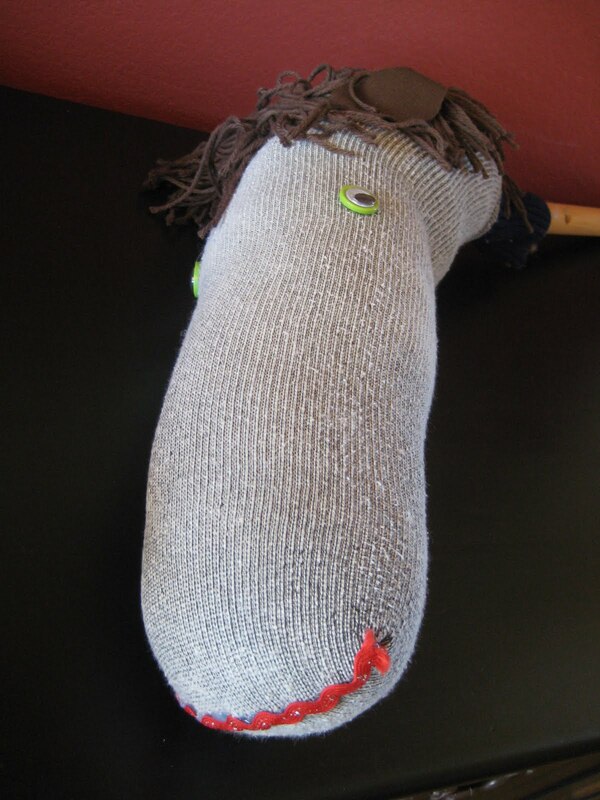 Finally, here is a picture of the magazine’s original hobby horse, which can be compared to my own take on it. Today was a great day! Why? Because I went to work for 8 hours and then followed it up with an hour of filling out tedious paperwork! Just kidding, it’s because my fall issue of Interweave Knits arrived in the mail, and with it, an idea for my nephew’s birthday present! My nephew is turning 2 in September, and picking out his present is a big freaking deal. Not only is he the most adorable, clever, fun, and sweet nephew ever (other than my other nephew, Riley), but he lives three and a half hours away, putting me pretty close to the top of the list of World’s Most Terrible Aunts. I don’t get to see him that often, and when I do, I feel like we just start to form a bond and then I have to leave again. It breaks my heart every time. Which is why picking out the perfect birthday present is so important! And I am hoping I found it. First of all, let me just say that a subscription to a good magazine is one of the best gifts I can think of (though this is NOT the gift I’m getting for my nephew), which is why I am so happy that I was given a subscription to Interweave Knits for Christmas. In my opinion, they produce some of the best content, and some of the best, cutest, and – most importantly – most wearable* clothes of any knitting magazine I’ve seen. Add to that their great online presence with excellent free content and videos, along with their attention to other crafts in addition to knitting, and I think they offer the best bang for your buck. Plus, there is the major point that I consistently like their patterns more than most other magazines, which tend to be hit or miss for me. Surprisingly, I wasn’t overly fond of many of this issue’s patterns because they just didn’t happen to be my style, but the ones I liked I fell in love with. And one of these, is going to be my nephew’s birthday present. What is this magical item, you ask? 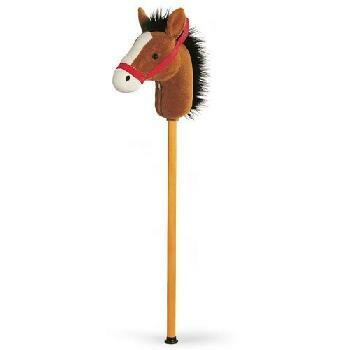 It’s a hobby horse, and it’s freaking awesome. Mine was named Trigger; he was made by my mother and was loved to death. We still have him, but I think he’s missing a few facial features at this point. The point of this toy is that a small child with a humongous imagination will straddle this stick, hold it with one hand and the ‘reins’ with the other, and gallop around on his or her ‘horse’, having all kinds of dangerous and wonderful adventures. I loved this toy, and I am hoping my nephew will as well. It is coming at a good time, I think, considering his new fascination with ‘skipping’, which tends to look more like a gallop anyway. I will post a pic as soon as I can, but for now suffice it to say that this one is very colorful, with a fair isle motif in big blocks of color all over it, and a funky blue mane sticking out the back! *By this I mean that many knitwear designers either go too simple with their clothes, so they’re boring to knit and to wear, or too complex so the clothes just look silly and no one except a super model or movie star would actually wear them out in public (I’m looking at you, Vogue Knitting.) Interweave Knits strikes a good balance by featuring beautiful clothing that is complex and interesting, but has classic lines and styles that anyone would feel chic and comfortable wearing. This, I think, is the mark of truly good design.